Bells will be Ringing in 2015! Join us for the Bells Collection this winter session running January 12 – March 16, 2015. We will gallop with “Trot, Old Joe,” learn an egg shaker passing game from Ghana in “Obwisana,” drum & jive with “Rhythms & Rhymes,” and create beautiful rounds in “The Bells of Westminster” – just to name a few of the 25 songs and chants in the collection from around the world. Register today online! While classes are over for 2014, please join us at some of our fun free community events! 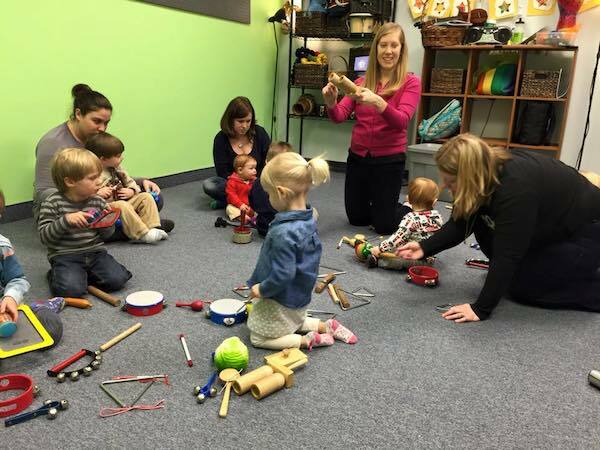 Wednesday, Dec 10: Music Together Demo 10:30 a.m. at the Grosse Pointe Music Academy – great for new families! Wednesday, Dec 17: The Canton Public Library is so kind to have us back again for two back-to-back holiday jam sessions at 10 am and 11 am. Pre-registration is required, so make sure to register online in advance and tell friends to do the same as we will bring favorite holiday tunes to life AND we will have great raffle prizes too! Register online here. Our Teaching Team Continues to Grow! We are so thankful to have found another amazing new teacher to join our team so we can provide classes for all of our friends! A big welcome to D. Giles Simmer! Giles is a trained and awarded lyric soprano. She has a B.A. in Music from Hillsdale College and a M.M. in Vocal Performance from Western Michigan University. Giles has performed throughout the state and has been a staff singer at St. John’s Episcopal Church in Detroit since 2009. Giles is very excited to be part of the Music Together program and also teaching voice at Grosse Pointe Music Academy. She’ll lead classes both in Canton and Grosse Pointe! We hope everyone is enjoying the early snow! If you are stuck inside, a fun activity at home to try is to ask your little one(s) to lead family and friends in a pretend music class. It is amazing to see what our children pick up from class – you may be amazed how much they are learning on top of all the fun they have with you in class! Hummingbirds Music Together is so thankful for all the wonderful families that join us to provide music education to our children! It is truly a blessing that you chose to share your time with us and we love hearing how our program brings music and joy into your homes! We wish all you a wonderful and safe holiday season!